Much of the earlier material below is extracted from the Records or the various island histories. Later material comes from the island’s newspapers and other sources. You can search our events database in various ways on our Chronology page. To search the original Records for yourself, see our Family And Friends page for contact details. Please note: although our database contains items, ranging from to , this is not a complete history, even of all the most important events; there are some we still have not yet managed to date. For the pre-discovery history of St Helena, see our pages Geology of St Helena and Endemic Species. St Helena rose from the sea in stages between 15 million and 7 million years ago, but was not discovered until 1502, probably in May, by the Portuguese. Being experienced navigators, the Portuguese saw the value of the island as a provisioning base for northbound sailing ships from the Far East, and tried to keep their discovery a secret (but failed!) They planted fruit trees but also released goats and pigs, providing for their needs while destroying much of the island’s endemic flora and fauna that had become established over millions of years. They did not initially settle St Helena or establish defences for their claim to the island. The Dutch and the English also saw value in possessing the island. 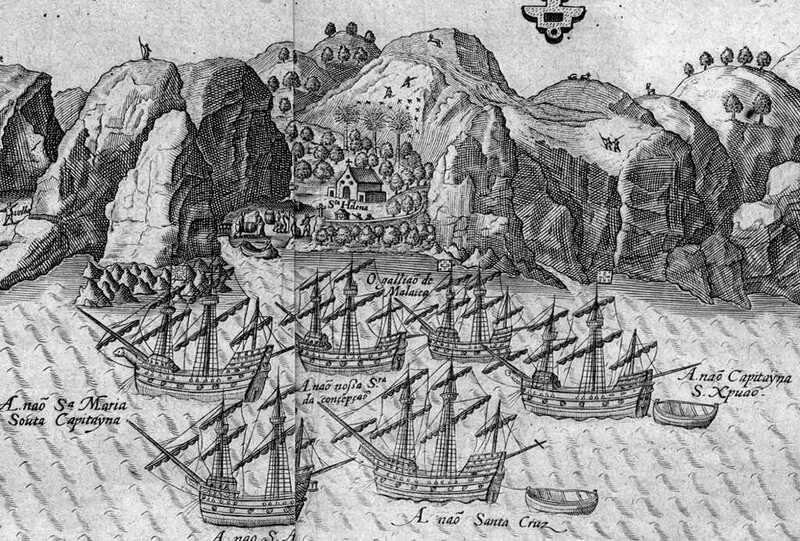 The Dutch claimed it in 1633 but they too did not settle St Helena or establish defences for their claim to the island. The English, however, did. On 5th May 1659 a fleet under John Dutton sent by The East India Company landed and established both a settlement and a fort. The island remained an East India Company possession continuously until 1834, with only one small exception - it was captured by the Dutch in December 1672 and re-taken by the English in May 1673. In 1834 the island was transferred to the British Crown, which has controlled it ever since, initially as a Colony and now as a British Overseas Territory, still with a Crown-appointed Governor but now with a democratically-elected legislature. Many famous people have visited St Helena, starting with some world explorers, then Edmund Halley who charted the southern hemisphere stars plus many other astronomers, British and other royalty including King George VI and his family (including then Princess, now Queen Elizabeth II) and most recently in 2002 by HRH Anne, The Princess Royal. The East India Company tried to make St Helena self-sufficient, but devoid of any worthwhile raw materials and with the climate unsympathetic to sustainable agriculture they failed and had to accept the cost of maintaining it because of its strategic value. The Crown tried and failed in the same way. As relative peace broke out amongst the sea-faring nations of Europe and sailing ships gave way to Steamships the usefulness of the island steadily decreased and the island descended into poverty, a process concluded by the withdrawal of the Garrison in 1906. Industries were tried but only one, the export of Flax and flax-products such as rope, had any success. This too failed in the 1960s as shipping costs rose and purchasers found cheaper sources. The island has required an annual subsidy from Britain ever since. Slaves arrived with the first settlers from the UK and were emancipated in phases from 1827. To their number were added Chinese labourers any many liberated Africans from slave-ships intercepted by the Royal Navy in the 1840s. These plus passing sailors from many origins intermingled to give a population with an extraordinarily extensive genetic mix - known today as ‘Saints’. As the island’s strategic value declined the British Government did find one use for it - as a remote place to hold political prisoners, including the defeated Napoleon, from 1815 until his death in 1821; around 6,000 Boers during the 2nd Boer War; Zulu Chief Dinuzulu and some other Zulus soon after; and various others. After investigations going back to the 1940s, in 2005 the British Government announced it would fund the construction of an airport for St Helena. After a false-start, construction began in 2012 and was completed in 2016. Sadly the completed airport could not operate with the aircraft it was designed to handle due to Windshear and eventually became fully operational using smaller aircraft in 2017. Tourists now come each week to walk our hills and see our remarkable scenery and landscapes, investigate our rare endemic animals and plants and meet the planet’s oldest living land animal, dive our warm clear seas to view the marine wildlife and study the many wrecks that litter our coast, investigate our forts and other 17th and 18th century architecture, including our Castle-that-doesn’t-look-like-a-castle and the oldest Anglican Church in the Southern Hemisphere and, of course, see where Napoleon lived, died and was buried. They end each day with a drink while exchanging stories and looking out to sea as travellers of old have done for at least 300 years. If you run a website about St Helena and want a potted history of the island, you could base it on the above. Just remember to credit Saint Helena Island Info.